Did you know that Twitter users are a bunch of Super Bowl cheering, American Idol watching, Google Wave using music lovers? That's according to Twitter's top trending topics list for 2009, anyway. Twitter recently released the list, which details the topics that people were talking about this year, in messages of 140 characters or less, of course. The hashtag Music Monday, used by twitter users to share what music they're listening to as they kick off the work week, was the most popular trending topic of 2009, according to Twitter . Tweets about Iran's elections came in a close second. Twitter didn't provide a complete breakdown of the 10 most popular terms overall, but the company did detail the most popular tweet topics in a variety of categories including news, people, movies, television shows, technology, sports, and hashtags. Twitter's year-end top trending list is based on worldwide tweet numbers. Technology became a disruptive force in Iran this summer when protests broke out over the results of that country's presidential elections. Tech tools like twitter, cell phones, digital cameras, Flickr, YouTube and Facebook were all employed to get the word out and raise global awareness about the controversy. Since the protests, the actual impact of Twitter and other technologies on the protests have been called into question, but there's no doubt Iran was a hot topic online this year. It's not surprising to see Michael Jackson grab the top spot following the entertainer's untimely death earlier this year. Other notable celebrities the world was tweeting about included YouTube sensation Susan Boyle, American Idol contestant Adam Lambert, and celebrities caught in the grip of scandal like Tiger Woods and Christian Bale. This was a year to talk about Action and Sci-Fi movies on Twitter with movies like District 9, Transformers 2, G.I. Joe and Watchmen taking up the bulk of the list. But did you notice that True Blood made the movie list? Now, something tells me those tweets were about HBO's televison series and not that forgettable vampire movie from the 80s starring Chad Lowe, Jeff Fahey and Sherilyn Fenn. American Idol just never seems to lose its mojo, and with amazing talent and antics from the likes of Adam Lambert the show topped Twitter's list. Soccer was the only non-North American sport to make it into Twitter's 10 most tweeted sports topics, claiming sixth and tenth place. Football fans took over three spots, basketball had two, with tennis, baseball and mixed martial arts rounding out the rest of the list. 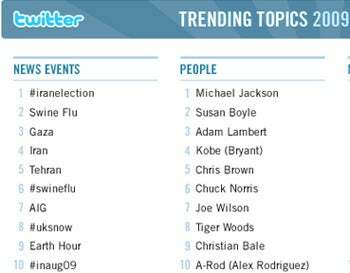 Google Wave was the hottest technology topic on Twitter for 2009. Google's collaborative work platform grabbed a large amount of interest when it was first announced, but since then enthusiasm for Wave has diminished. Apple and Microsoft got their fair share of tweets after launching the Snow Leopard and Windows 7 operating systems. And Palm's Pre was the only smartphone to make any of Twitter's top ten lists for 2009. Last, but not least, we have the hashtags category. Hashtags are a user-developed method to make it easier to search within Twitter for particular keywords. Hashtags also create a unifying thread for people posting messages about a given topic. But what's surprising is how few hashtags there are in the other topic lists. A total of six hashtags made it into the top 60 topics detailed above. I guess hashtags aren't that popular overall among Twitter's userbase. Twitter's dedicated hashtag list for 2009 is occupied mostly by memes like #rememberwhen, #iwish and #nevertrust. Regular tweeters will also notice that Follow Friday didn't rank among the top 10 hashtags. Many Twitter users end their work week by posting recommendations for accounts worth following using the #ff of #FollowFriday hashtags. So there you have it, Twitter's top trending topics for 2009. In just a few weeks, we'll start the process all over again, tweeting about health panics , political upheaval , inspiring moments of hope and the promise of change .